Researchers around the world who study Earth’s snow, ice, and climate access data from NSIDC’s active data archive, a bank of computers and storage devices that require a cool environment to operate. NSIDC provides 120 terabytes of scientific data to researchers across the globe. In order to deliver the cryospheric data to researchers worldwide, the full-time data center runs around the clock, which requires a constant energy demand. Just cooling NSIDC's computer room used to require over 300,000 kilowatt-hours of energy per year, enough to power 34 homes. “There was a certain irony that here we are working on climate research and our data center was consuming an awful lot of power,” said David Gallaher, Technical Services Manager for NSIDC. So when the aging cooling system needed to be replaced, NSIDC decided to go green, and the NSIDC Green Data Center went online in the summer of 2011. The innovative data center redesign slashed energy consumption for data center cooling by more than 90 percent, demonstrating how other data centers and the technology industry can save energy and reduce carbon emissions. This Web site offers information to help others who may be interested in pursuing a green data center of their own. You can also view our Green Data Center Monitoring System (created by team member Benjamin Weerts, a CU Graduate Research Assistant) showing the currrent environment in our Green Data Center, updated every fifteen minutes. 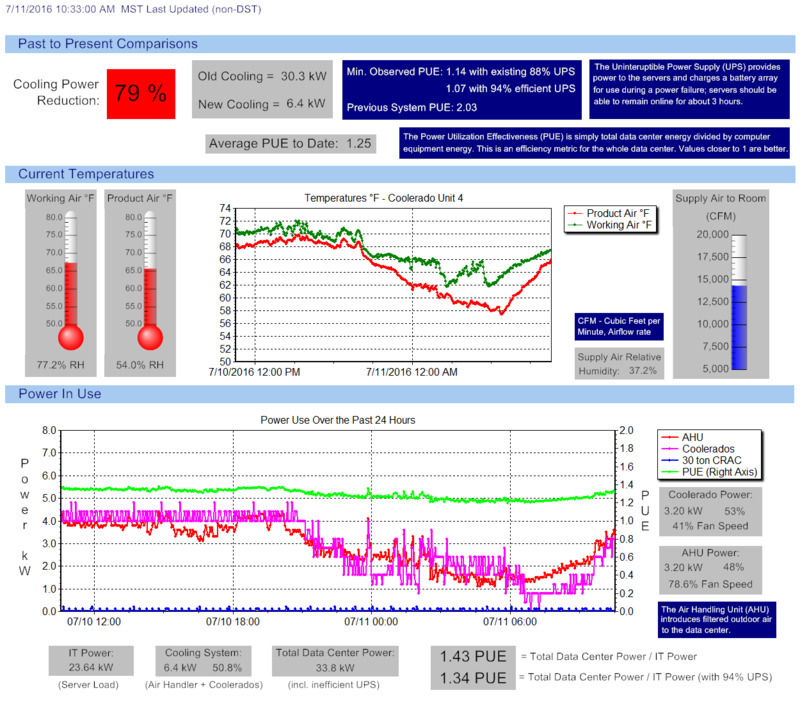 The monitoring system includes temperature, humidity, airflow, and electrical power measurements that allow characterization of the heat gain from the data center equipment, the heat removed by the cooling system, the energy consumption of the cooling equipment, and the uniformity of conditions within the data center. The data are analyzed and aggregated to describe instantaneous power and thermodynamic conditions, as well as long term system efficiency. The monitoring data are augmented by one-time measurements of velocities and air pressures. The Green Data Center project, funded by the National Science Foundation (NSF) under its Academic Research Infrastructure Program, with additional support from NASA, shows NSIDC's commitment to reducing its impact on the environment, and that there is significant opportunity to improve the efficiency of data centers in the U.S. The heart of the design includes new cooling technology that uses 90 percent less energy than traditional air conditioning, and an extensive rooftop solar array that results in a total energy savings of 70 percent. The new evaporative cooling units not only save energy, but also offer lower cost of maintenance. The Green Data Center design takes advantage of Boulder’s arid climate, using a new technology called indirect evaporative cooling. These units, manufactured by Coolerado Corporation, cool by blowing air over water, using much less energy than compressors. Unlike traditional evaporative cooling, indirect evaporative cooling does not add humidity to the room, maintaining the dry environment that computers need. Smart control technology also saves energy. During much of the year, the system cools the data center by pulling in and filtering outdoor air. On hot days, the new cooling units automatically step in. The solar array feeds energy back into the electrical grid, further reducing the center’s net carbon footprint. In case of a power outage, the solar array will charge the batteries that provide NSIDC’s emergency power supply. “The technology works, and it shows that others can do this too,” said Gallaher. “Data centers are big consumers of energy, and a lot of it is for cooling.” According to the U.S. Environmental Protection Agency (EPA), as of 2006, U.S. data centers were estimated to consume 61 billion kilowatt hours of electricity, equivalent to the electricity consumed by 5.8 million average U.S. households. By 2020, the carbon footprint of data centers will exceed the airline industry. The Green Data Center design team was led by NSIDC Technical Services Manager David Gallaher, in collaboration with Director Mark Serreze, and DAAC Manager Ronald Weaver from NSIDC; Rick Osbaugh from RMH Group in Denver; Otto Van Geet from the National Renewable Energy Laboratory (NREL); and Lee Gillan from Coolerado Corporation.